Jeera Rice (also known as Zeera Rice or Jeera Pulao) is one of the easiest of all variety rice dishes. It is nothing but, boiled rice flavored with cumin seeds. 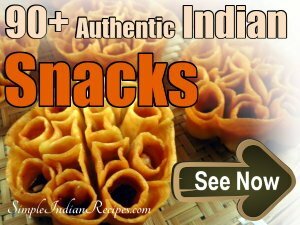 It is popular all over North India especially in the Punjabi cuisine. In Pakistan it is known as Zeera Rice. Jeera Pulao goes along with any kind of side dish. So jeera rice is the best choice for parties or any kind of get together. 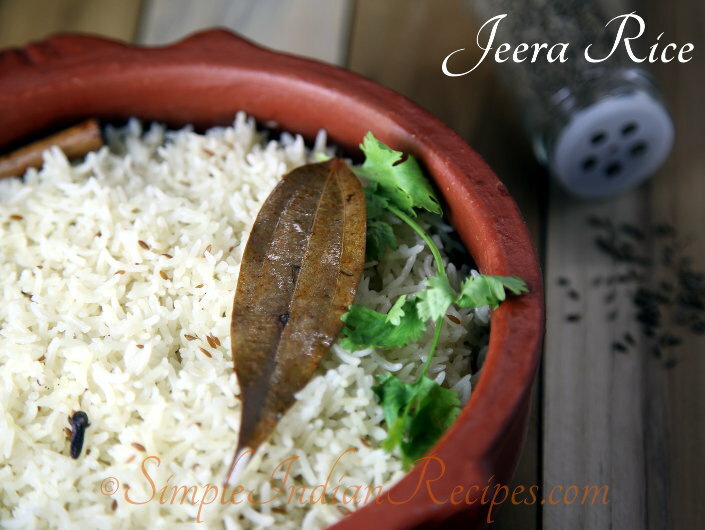 I always make jeera rice for parties along with 2-3 gravies and side dishes. Kids and adults enjoy it equally. Bachelors can also make this and enjoy with some simple dal. It tastes awesome. 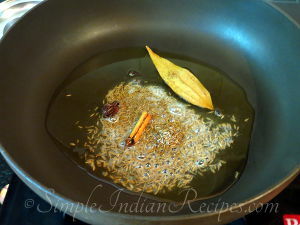 The ingredients used for making jeera rice are very basic. We need good quality basmati rice, cumin seeds and some ghee. All other ingredients are optional. 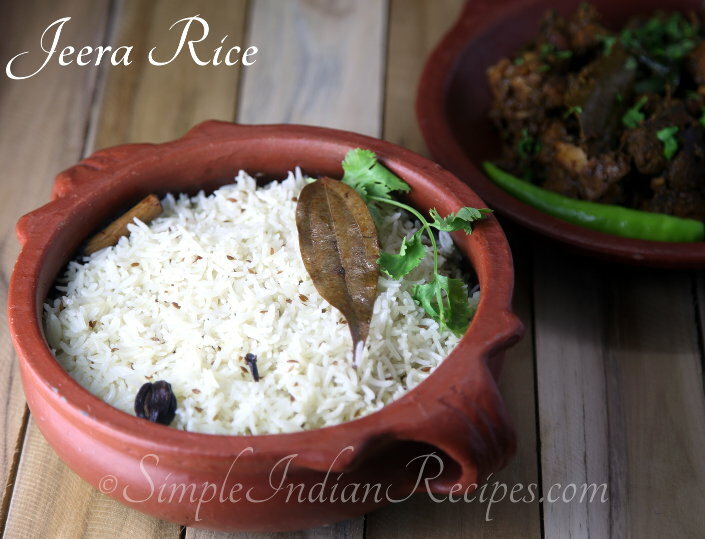 My kids love jeera rice as it has very mild flavor which pleases their taste buds. Their favorite combination is jeera rice with any mild creamy gravies like butter chicken, malai kofta or paneer butter masala. 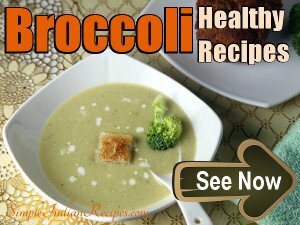 You can make this dish in a heavy bottomed pot, pressure cooker or in an electric rice cooker. I have given instructions for all types of preparations in the appropriate places in the recipe below. Make it in any way you are comfortable with and enjoy. Wash and soak the rice for at least half an hour. Drain the water and keep it aside. 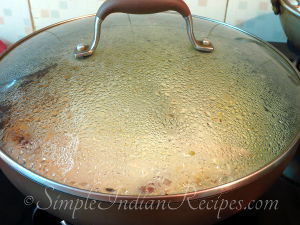 Heat the ghee in a pan or pressure cooker. 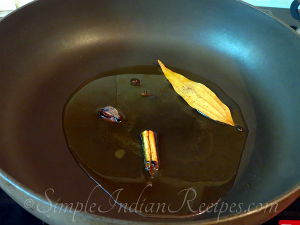 Add the whole garam masala and fry for few seconds. Add the cumin seeds and crackle it. 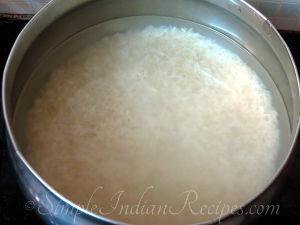 Measure exact amount of hot water and add to the rice. Adding hot water gives the best results. Also, add required salt. Cover the pan and bring to a boil. If you are using a pressure cooker, close the cooker and bring to a boil. Once it boils, reduce the flame to low, cover with a tight lid and cook for about 15 minutes till all the moisture is absorbed by the rice. 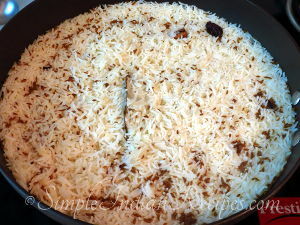 The rice will be cooked soft and small holes appear on top. If using a pressure cooker, put the whistle and cook for 10 minutes on low flame. 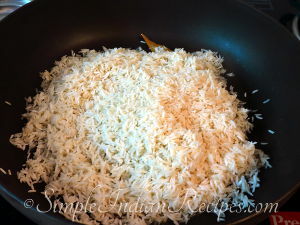 Fluff it up with a fork to keep the rice grains separate. Garnish with finely chopped cilantro or fried onions or toasted cashews. This jeera rice can be served with any kind of gravies, either vegetarian and non-vegetarian. 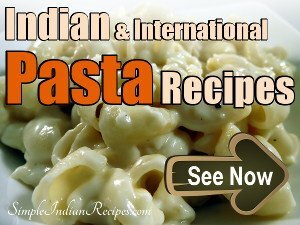 I love to serve it with dal makhani, paneer butter masala, malai kofta or butter chicken. Hi! Can you please explain what do you mean by "Measure exact amount of hot water"? Is it the water we have used for soaking the rice or a new one? Is it 2,5 cups as you said at the beginning? HI Ines, You have to soak the rice with water enough to submerge the rice. Later you drain it. 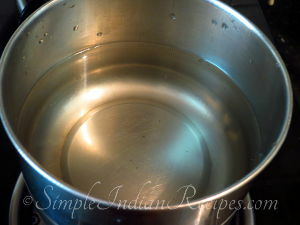 2.5 cups of water is used for cooking it. This will easily serve 4-5 adults. I make that version too. i observed that u use cilantro in all ur recipes.can i know thae reason? 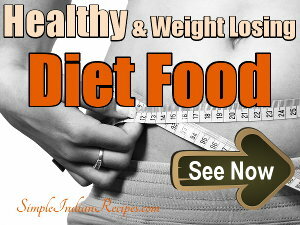 Hi Kavitha, I love the flavour of fresh cilantro. Please feel free to skip it if you are not a big fan of it. I would recommend Basmati Rice. 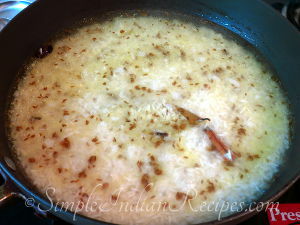 try cooking any rice with jeera,chopped onions and a couple of teaspoonfuls of clarified butter. Sure Bhat. I just love the flavour of Basmati Rice. 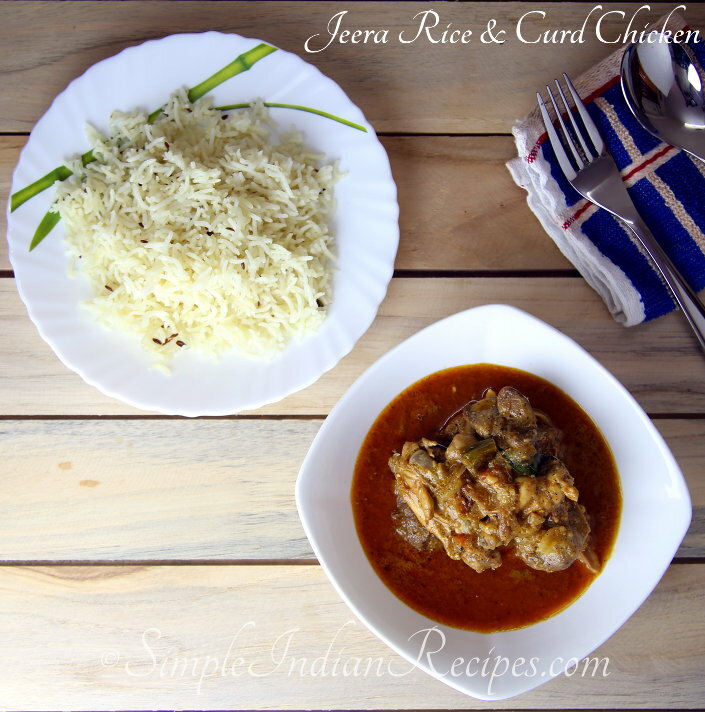 Hi, As my family is coming to my home for EID, I had tried this recipe and had prepared this variation of Jeera rice. It came out SUPERB. My whole family including my husband love it so much that my husband ask me to prepare the same rice for the next day for his family. Thank you so much. Hi Fatimah, You are right. 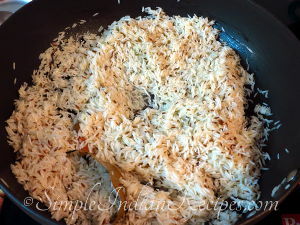 This is a very simple and very flavourful pulav that goes very well with any kind of gravies for any occasion. thanks dear, well even i dont like to slave in the kitchen.. do try all the recipes. 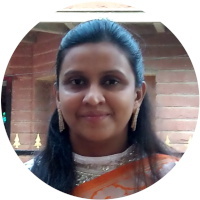 Published by Dahlia Twinkle on 2012-03-06 and last updated on 2017-09-21.